“I like joy; I want to be joyous. I want to smile and I want to make people laugh. And that’s all I want. I like being happy. 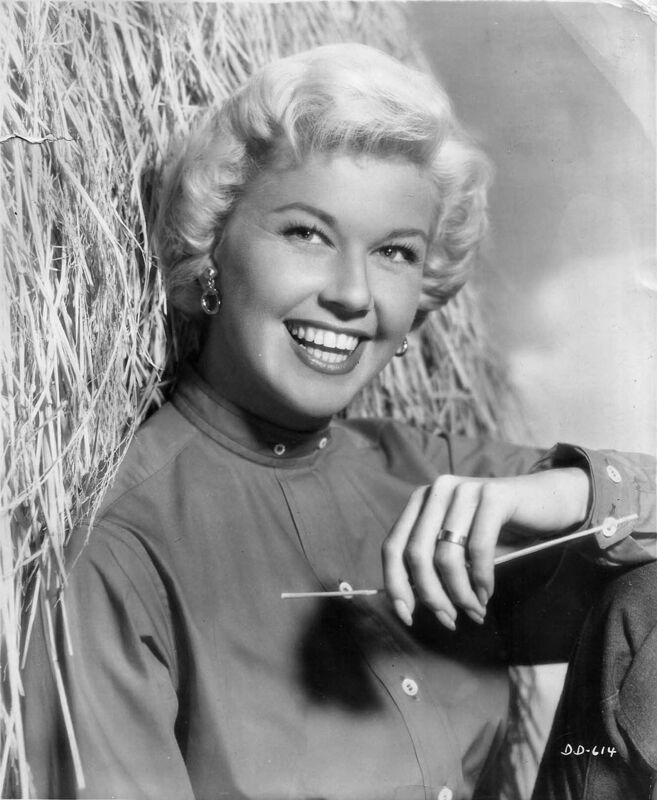 I want to make others happy.” Doris Day. Sarah Weller celebrates Doris Day’s 91st birthday Photo: Carl Hyde. Courtesy of Sarah Weller. The second part of my birthday bash this year was a total surprise – a well-kept secret; nothing was revealed to me as we travelled into the West End of London. I hadn’t been up to Soho for some time and the amount of demolition going on was a huge shock. They’ve even pulled down The Astoria – an iconic venue – where our artist’s performed back when. Tin Pan Alley is next on the demolition schedule I understand; what a travesty that will be – something to do with Cross-Rail apparently. I recall many hours standing in this or that music publisher’s, back in the late 1960’s, waiting for my then boyfriend (later husband) and his band, as they trolled through sheet music with their management, looking for new songs to perform. Their own song-writing efforts ended up as sheet music there as well. It was a fab place to see, and be seen, and boy did we see some famous bands, many singers – even the late Cilla Black was there on more than one occasion seeking songs – and songwriters too, all busy selecting their next big hit! But, hey! That’s another story for another day. I have something coming out soon which tells a little of these times. I found myself in Frith Street, and there in front of me loomed another iconic venue. Surely not! It couldn’t be, could it? But it was. We were in the queue at Ronnie Scott’s world-famous Jazz venue and I still didn’t have a clue why I was there. Earlier in the year I’d been asked what I was doing on 29th March 2015 – a few weeks after my own birthday – I said nothing much, I seem to recall. I was told not to plan anything; I was going somewhere special. 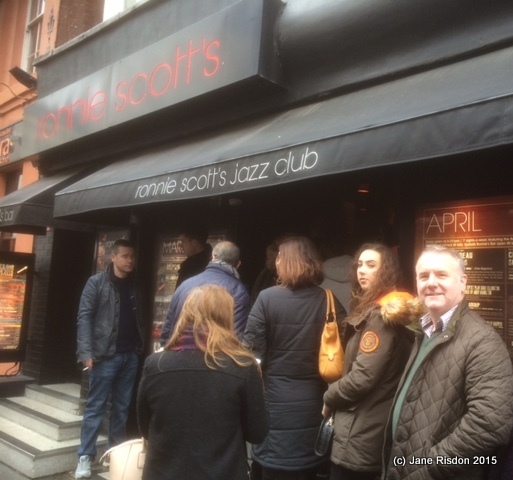 Then on 29th March I found myself outside Ronnie Scott’s, just after lunchtime, about to go in and see…I had no idea. Questions went unanswered, smiles looked knowing. Nothing was being given away. I looked round for clues, but there was nothing. We were shown to our table and served huge Bloody Marys as the venue filled. I had a feeling of dread spread through me as I spotted a birthday cake set upon a round table on the stage; a spotlight shining upon it. Oh good grief! They’d better not have! Still my companions wouldn’t let on who was going to be performing. I was so excited, I’d never had a surprise birthday quite like this before. The lights dimmed; a pianist, a double bass player, a trumpeter, and guitarist, appeared on stage and settled themselves. My heart almost stopped. Sarah Weller and her band: The Mad Men. I still didn’t get it. Who was she? I had no idea. Two pairs of eyes beside me watched my face eagerly, waiting for the penny to drop. Tears trickled – I don’t do crying as a rule, so this was a big deal. Sarah Weller would be performing a tribute to Doris, whose 91st birthday would fall on April 3rd. 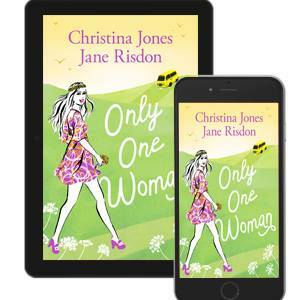 She does not impersonate Doris – who could? At the end of the show she would be cutting birthday cake and sharing it with those celebrating birthdays around the same time. She does this every year. She is a massive fan too. Sarah discovered – I later found out – that Doris sings in quite a low-key, which is not apparent when you hear her recordings. If you hear Sarah sing you’d be forgiven for thinking she sounds quite low, and that perhaps the key is wrong. It is not. Sarah sings a tribute to Doris using the icon’s songs, with snippets of information about her life, recordings, and movies. Calamity Jane (my favourite of her musicals) featuring Howard Keel, another of my all time favourites. Love Me or Leave Me, and Young at Heart. Songs such as: Sentimental Journey which was Doris’ first million seller in 1945 with the Les Brown Band. which was number one for 9 weeks. “It was evening, and we passed under the Golden Gate Bridge…its lights went on, and the voice of Doris Day began singing ‘Sentimental Journey’ over the loud-speakers. Well, that was the saddest bunch of sailors you ever saw. She had the whole ship in tears, including me. Fifteen years later, Doris and I worked together for the first time in Pillow Talk and by way of contrast, it was laughter all the way…” – Rock Hudson. Rock and Doris made three movies together: ‘Send Me No Flowers,’ and ‘Pillow Talk,’ and their last film together, ‘Love Come Back.’ Three of her funniest films I think. Though my all time favourite is still ‘Calamity Jane,’ because I adore the songs. Sarah is a lifelong fan – like me – and her show pays tribute to the long and varied career Doris has enjoyed, and which made her a number one box-office star in the movies – she made 39 movies in 20 years – and a top-selling singer with almost 500 recordings. I could hardly contain myself, I was overcome and couldn’t speak. My companions laughed as I choked back the tears. The music started and Sarah told us a little about the song, when it was recorded, and for which movie, and she continued to do this for every song throughout her performance. ‘With a Song in My Heart,’ ‘Stardust,’ ‘I Know that You Know,’ ‘Makin’ Whoopee,’ ‘The One I Love (belongs to somebody else),’ ‘Bumblebee,’ and a medley from ‘Calamity Jane.’ which was awesome. The audience went wild, many joining in singing along. The atmosphere was magic. I was struck by the varied ages of the audience – young and older – and also by the many accents which we heard around us. The venue had sold out for the show well in advance of Sarah’s performance. I soon found out why. Sarah Weller is an amazing performer and singer in her own right, even without having the songs of Doris to interpret. Sarah left the stage when she’d completed the first set, and meals and drinks were served for those wanting them. We were going on elsewhere later, so just had Bloody Mary refills. I love Ronnie Scott’s – it is such an intimate and vibrant club where all the greats have performed at some time or another. Ronnie Scott OBE (1927-1996) was a jazz legend; originally a tenor saxophonist with the Johnny Claes band in 1944, and later with many others including Ted Heath and Bert Ambrose. They moved to Frith Street in 1965 and the club became ‘Ronnie Scott’s,’ in 1967. Sarah returned to the stage, dress in a beautiful green full length frock. Her second set continued with more chat and snippets about Doris, and her recording and movie career, as well as some more background (personal) detail about Doris’ life. 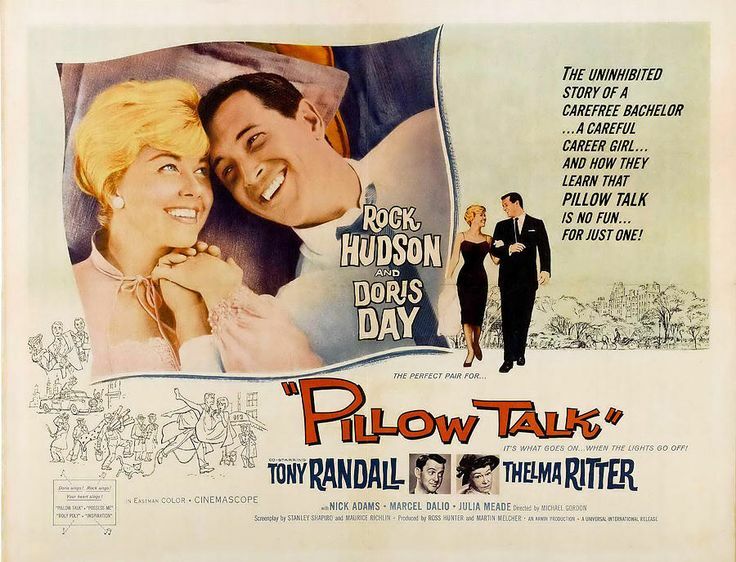 Then everyone joined in with ‘Hernando’s Hideaway,’ and ‘Teacher’s Pet,’ then ‘Close Your Eyes,’ followed by another personal favourite Sarah and I share; ‘Pillow Talk.’ from another wonderful movie she made with Rock Hudson – one of three they made. “Before we got under way, I had some apprehensions. I had never played comedy before, and here I was, thrown together with one of Hollywood’s most accomplished comediennes…but the best acting lesson came from Doris – her sense of timing, her instincts – I just kept my eyes open and copied her. I don’t really know what makes a movie team….I’d say, first of all, the two people have to truly like each other, as Doris and I did, for that shines through…” – Rock Hudson. Rock Hudson and Doris became life-long friends right up until his death in the 1980s from Aids. ‘Move Over Darling,’ came next. Terry was her only son from her first marriage to trombone player, Al Jordan. They eventually divorced. She was married three times in total. Terry was legally adopted by her third husband – the agent and producer – Marty Melcher. A much disliked figure around Hollywood who eventually left Doris with huge debts. A curious piece of trivia for you, which I will slip in, before I continue with Sarah’s set list. It is widely believed that Terry Melcher was the intended victim of Charles Manson and his followers who broke into the home of Sharon Tate and Roman Polanski in 1969 and committed numerous murders. At one time Terry had rented the property on Cielo Drive, in LA, with his then girl-friend, Candice Bergen. Luckily they weren’t there at the time. Apparently the record producer had turned Charles Manson down for a recording contract and the Cult leader wanted his revenge. Many years later our son went to work for a movie producer who lived in a newly constructed house on the site of the, by then, demolished house, which had born witness to such atrocities. 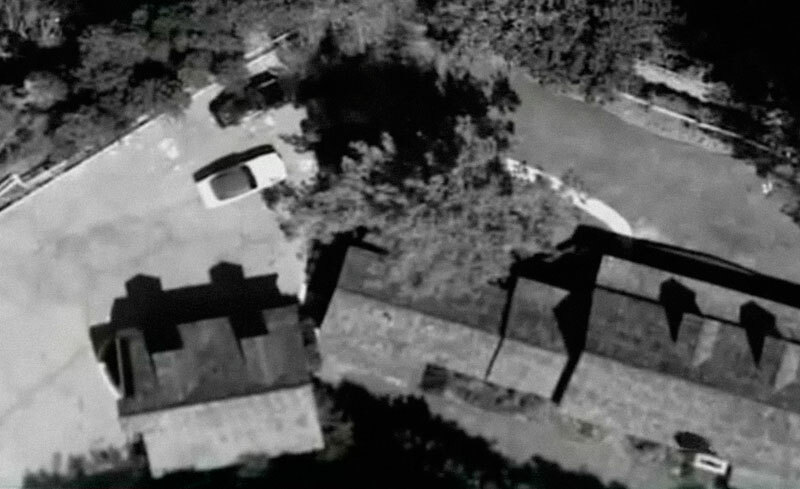 Before the original house was demolished it was purchased and lived in by a member of the band ‘Nine Inch Nails.’ But he decided it was too sad a place to live and felt uncomfortable there. Not surprisingly. Terry helped rescue his mother from financial ruin, brought about my her husband, Marty Melcher’s mis-management of her career, when, in the 1980’s he produced his mother’s come-back TV series, ‘Doris Day’s Best Friends,’ and helped her run the Doris Day Animal League and the Doris Day Animal Foundation. Rock Hudson appeared on her show, just two months before he died. Sadly, Terry died in 2004 from cancer, leaving a wife Teresa and a son, Ryan. Sarah went on to serve a birthday cake she’d made, to those in the audience who were celebrating their birthdays around the same time as Doris. I was tempted to join in, but decided to sit and enjoy the atmosphere instead. Sarah serves cake every year, which I felt was a lovely touch. Needless to say, there was a long queue for cake. Disappointingly, Sarah didn’t perform a song which I also really love, and which Doris is supposed to have recorded in one take. But I soon got over it. 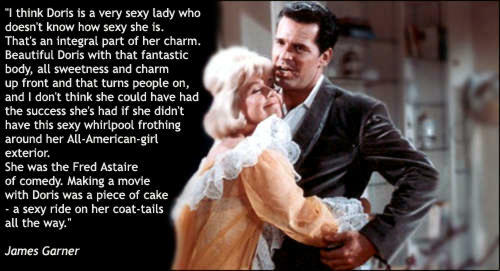 ‘Secret Love,’ from Calamity Jane. To record a song in one take is special, and I have actually worked with two female artists (managed them) who could also do this. True professionals and unbelievable talent. I absolutely loved the whole show. The musicianship was wonderful, and I should know. Sarah is an amazing performer, she does not try to be Doris or look like her. She sings in her own voice. Hers is a real tribute to a fantastic performer. Her band are talented players and it must be wonderful to perform with them. They are: Freddie Gavita, trumpet: Simon Golding, guitar: Arthur Lea, piano: Spencer Brown, bass: Simon Pearson, drums. 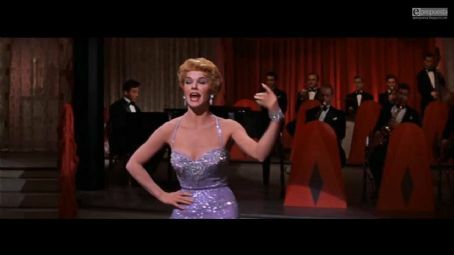 Doris also made movies with other much loved actors such: James Garner, David Niven, Rod Taylor, Cary Grant, and James Stewart to name a few. 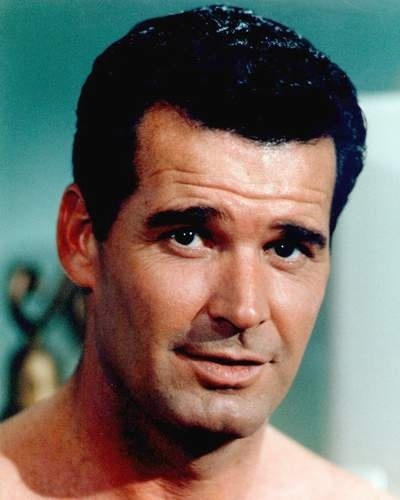 “I had the same kinship with Jimmy (James Garner) that I had with Rock-truly a blessing to have had two such talented, amusing, darling men to work with, men with whom I have had enduring friendships. 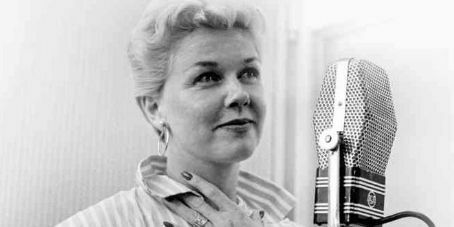 I really love Rock and Jimmy.” – Doris Day, Her Own Story. Following the performance by Sarah and her band, my two companions, who’d treated me to such a fab time, took me out to eats and to meet some friends of theirs in the Palladium bar, at the London Palladium. A perfect end to a perfect birthday weekend, although my birthday was earlier in the month. It was a fab way to join in Doris Day’s 91st birthday celebrations. 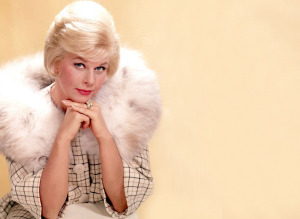 Ever since I was a little girl I have loved Doris Day, her songs, dancing and movies. I cannot explain why, at such a young age, she captivated me. I can sit through her movies time after time and never be bored. I can listen to ‘the voice with a smile,’ and she uplifts me. There are few female singers I really like, but she is top of the list for me. I wanted to be her when I was growing up. who made my treat so special and memorable. I did, after seeing her wonderful performance. 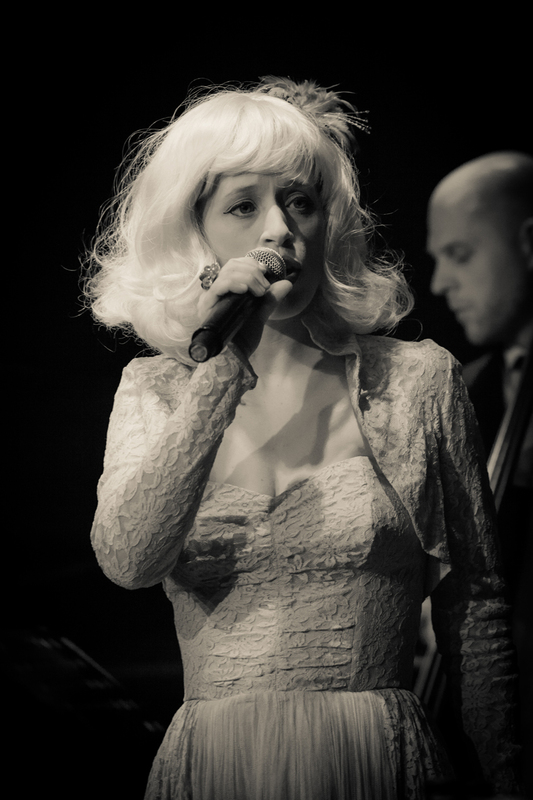 So, I contacted her and asked her to allow me to use her photos of her show at Ronnie Scott’s. She graciously agreed. Not only that, she agreed to allow me to interview her. Here is my interview with Sarah Weller. 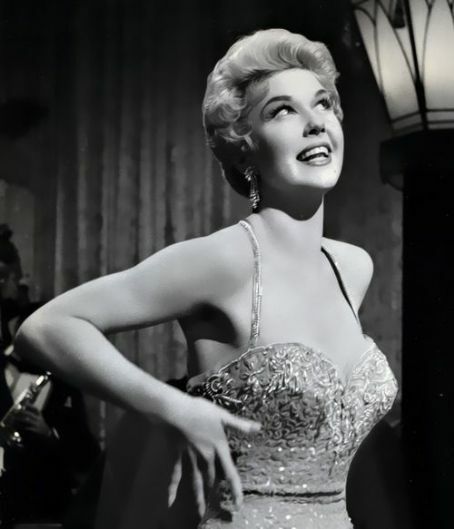 I hope this makes you want to see her perform, not just Doris Day hits, but Jazz, which she loves and performs in her own right. She has a record out at the moment. At what age did you realise you wanted to sing? Age 5. My mum told me to get my head out of the clouds. Where & when was your first performance (school/clubs etc)? I did a lot of acting at school and one of my earliest performances was as Levi in Joseph and his Technicolour Dream Coat. I always loved both acting and singing. Did you have, or ever contemplate having, singing lessons? – I had 11 lessons with jazz vocalist Lee Gibson at The Guildhall as a private student until the money ran out… I sang in the school choir and loved that. The highlight was Carmina Burana at the Albert Hall as part of A Night of 1000 Voices. Did you ever use a hairbrush as a mic, and did you sing in your bedroom? Of course, especially along to Barbara Streisand, Whitney Houston and George Benson. Whose records did you sing along to growing up, and in your bedroom? Anything by Barbara Streisand, Whitney Houston and George Benson. Do you play an instrument? What is it, and how did you learn – lessons or by ear? NO. Do you write songs of your own, or do you prefer to sing those written by others? I do write my own songs and it’s something I should do more often. I have released albums with a mix of originals and covers but it’s hard to beat the likes of Cole Porter and Irving Berlin! Who is your favourite songwriter/composer and why? Irving Berlin, Gus Khan, Cole Porter. 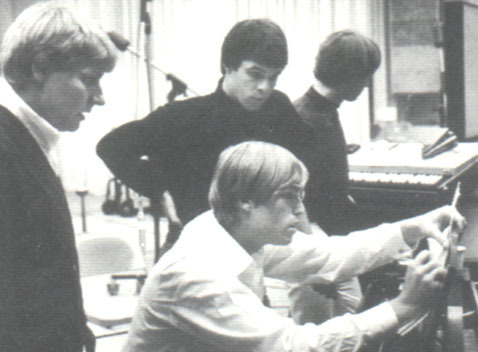 It was their job and so they continually churned out fantastic lyrics and music in so many genres. What was the first real gig you ever went to? Band? Singer? And where? Michael Jackson 1989 during his BAD tour at Wembley Arena. Who makes your frocks for your performances? Are your Doris Day frocks made by someone else, or the same person, or do you buy ‘off the peg’? Vintage all the way. I scour the charity shops. The yellow one I wear was my wedding dress from 2002 when I got married in Vegas! Where do you get your blonde wigs? Are these specially made? No, I chose one-off the internet from a site like wigs.com that seemed appropriate for the show then had it cut whilst on my head at the hairdressers while showing the hairdresser a photo of Doris! What do you do to relax? Cycle, a sport that Doris herself loved. Who do you listen to when not learning someone’s songs/music to perform? Jazz, I can’t get enough of it. What genres of music do you love and why? Jazz, soul and funk. I have to listen to something that has a groove because I love to dance. What genre of music do you dislike the most and why? There are so many genres I find it hard to appreciate. There is so much good music that I just avoid the sound of anything that doesn’t interest me but then time passes and sometimes I can appreciate things from the past that I hadn’t liked at the time. I’m quite open to change! If you could travel anywhere in the world to see someone perform, who would it be and where would you love to enjoy the gig? I think I would love to listen to music in Tokyo, a place I would love to visit so it would have to be Pat Metheny at The Blue Note. Who would you love to give a private performance for and why? Or have you already? Who and where and why? An influential agent who would sign me up and get me on the road 365 days a year! Singing is all I ever want to do. If you weren’t a performer, what would you do for a living? 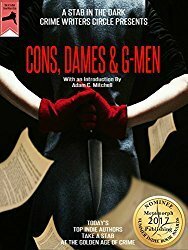 Be a detective or a writer of detective fiction. It’s the why and how I love. If you met Doris Day and could spend time with her, what would you like to ask her? If I managed to speak (from adoration silencing me) I would ask her what it was like to be a woman of the 50s. The era fascinates me and I would like every detail, who she met, who influenced her in her life, what made her so strong. Which is your favourite Doris Day song and why? Que Sera Sera. I love the sentiment, the idea of fate, the idea that no matter what the age nothing changes, it circles around and around. It also makes me think of my children then I have to try not to cry. Which is your favourite Doris Day movie and why? Pillow Talk for the glamour and the comedy. Who is your favourite leading man in a Doris Day movie and why? 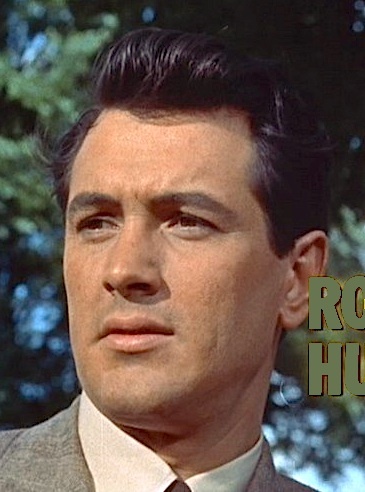 Rock Hudson. He was so handsome. 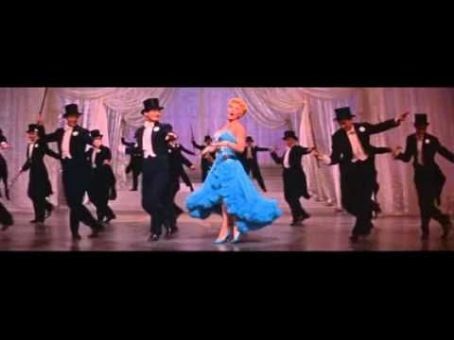 What is it about Doris Day that made you want to sing her songs and to perform a tribute to her each birthday? Her generous heart and I like strong women and I think there are very few as strong and enduring as Doris Day. She worked so hard all her life and had to go through such hardships in her personal life and she still dedicates her life to others. If you could have a songwriter/composer write specifically for you, who would it be and why? I would like Cole Porter to write a witty song. I miss comedy in performance. What style would you like them to write in for you? Jazz from the 50s of course! How did you come to have the band you work with? When and where did you find them? I’m lucky to have seen and played with many musicians and now I like to choose musicians that I like personally as well as for their talents. Did they ask to back you or did you ask them? When and where was your first gig with them? I had played with them all in different bands so asked them to join me when I got the band together. The first gig together was at Ronnie Scott’s 2010. Only the pianist has changed. 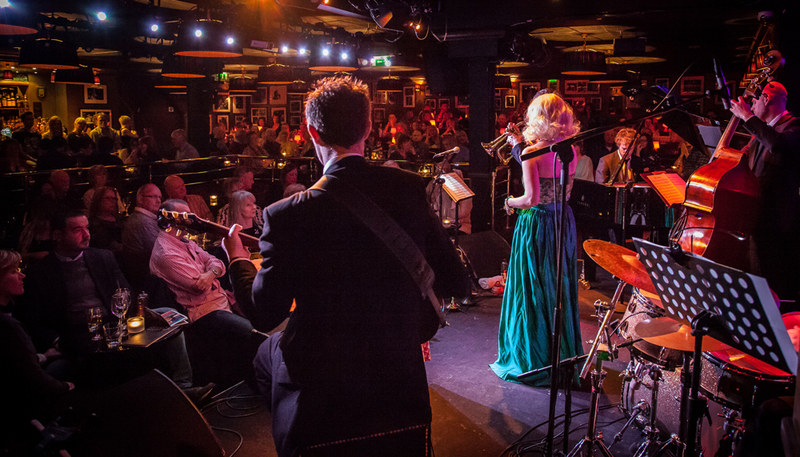 Ronnie Scott’s is an iconic venue – when was your first gig there and what did you perform? How did it feel being on the stage so many famous stars had performed on? June 2010. It was a dream come true and extremely nerve-racking. I will never take any gig for granted especially at Ronnie’s. Do you have a recording contract and is it for being a singer in your own right, or as someone who does covers of other artists? No I self-release under my label Daisy Dog Productions. I felt I didn’t want to record or release the Doris show as an album. I encourage people to go out and buy her records and appreciate her voice for the marvel it is. 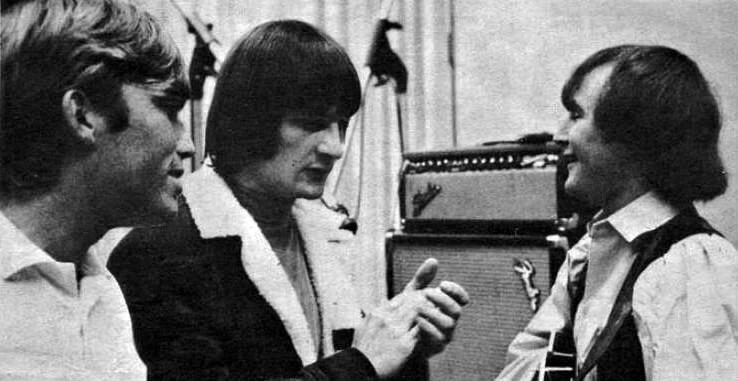 If you could record/perform with someone from the past – musicians or other vocalists – who would that be and why? I think I would have liked the Donna Summer role in the song Enough is Enough with Barbra Streisand. Barbra was such an influence early on – not so much now, but as a girl wanting to be a singer. If you could record/perform with someone from the present – musicians or other vocalists – who would that be and why? Christian McBride on bass, Aaron Diehl on piano and Kendrick Scott on drums. They are my favourite rhythm section at the moment. Have you ever wanted to perform a Movie or TV soundtrack? If you could pick one from the past what would it have been? Are there any movies being made today you’d love to have a crack at performing the soundtracks for? I would love to. I love Mad Men so to feature on the sound track would be amazing because the music is so well-chosen every episode. Where do you see your career heading in the future and what are your ambitions? As long as I am singing I will be happy. Sarah, many thanks for agreeing to feature in my blog and for taking the time to share your photos and other information with me. Huge thanks also to Tim and Mark for giving me such a fantastic birthday treat. I feel so privileged and spoiled, and appreciate it more than you can ever know. Sarah’s photos come from her own Collection. The Photographer: Carl Hyde. Thanks so much for allowing me to use them. I do hope you have enjoyed reading about my birthday bash, and finding out about Doris Day and Sarah Weller. Thanks so much for reblogging. Glad you enjoyed it. What a fabulous post! I am also a huge Doris Day fan, and I savored all your fascinating tidbits. Lucky you to have experienced this Doris Day tribute. My compliments! What a treat!! 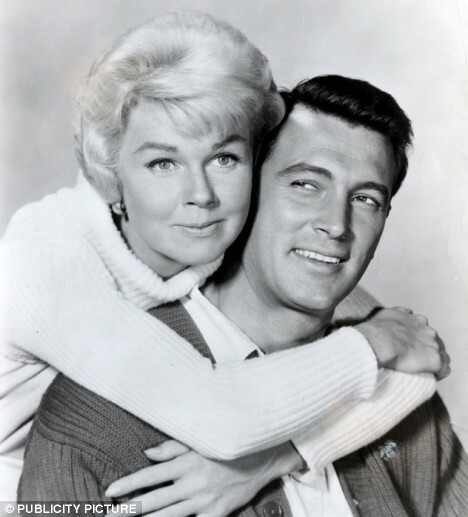 I always loved Doris Day and when combined with Rock Hudson, it was pure magic during my teen and young adult years.I wish I had her attitude—loving life and joy!! Doris Day is one of my favourite stars of all time., Katharine Hepburn being the only other one, and I’d have married her. So glad you had a nice time. Happy belated Birthday. Happy to oblige. I am glad you found me and enjoyed the Doris Day piece. Thanks so much, do pop back again. Always welcome. What a wonderful post, Jane! Happy belated birthday, and I’m glad about your magical evening. I bet. A complex and very enjoyable post. I enjoyed your article on Doris Day and your birthday bash. It brought back many memories of the past. I saw Elvis in concert in 1957 in Chicago. Great birthdau bash for you. I had forgotten,well, not really, DD. But I loved Calam. And Howard Keel too. Saw lots of the otherd,wll that was the time we ll went to the cinema, lotsif them around, all showing different films. Thank you for this. Bless. What an absolutely wonderful birthday treat, Jane!! Just perfect! I’m so glad you had such a great time, and thanks for sharing with us.